Crosshairs is a character that hasn't really ever been in the spotlight, in any continuity. Matter of fact, Crosshairs has really only had a handful of appearances over the course of the brand. At the very beginning, Generation 1 Crosshairs was a Targetmaster that transformed into some sort of red & blue Cybertronian truck thing. This version is a large departure from that! Disclaimer: I am not a fan of movie line toys - color me a Classics fan. I only bought a handful of the movie toys after the 2007 flick, and have since sold off each and every one. I can't remember buying any of the screen characters from Revenge of the Fallen, but did dabble in a few of the outstanding scout class figures as well as Voyager Bludgeon. Dark of the Moon was also a big wallet-saving time period for me, with only two Cyberverse acquisitions (Guzzle & Powerglide), and two gifts of Air Raid & Specialist Ratchet. Only a small number of Movie-verse figures remain in my collection, so I didn't expect to buy any of the Age of Extinction figures. Based on the movie trailers, I fully expected the Crosshairs character to be a flat, Autobot warrior-filler with few lines or screentime (e.g. Jolt, Sideswipe, Arcee, etc.). After seeing the movie, I came away impressed by Crosshairs. I think he was my favorite Autobot in the entire film, possibly the series as a whole. I like his swagger, his design, and his car mode. I just had to buy the figure and see what the new movie line figures are all about. Read on, and you'll see that I'm still impressed with Crosshairs. Crosshairs' alternate mode is a 2014 Chevrolet C7 Corvette Stingray. The vehicle mode is slick, and I like this design better than the concept Stingray that Sideswipe transformed into during Revenge of the Fallen and Dark of the Moon. This design is a bit boxier and seems to pull more design cues from the Corvettes of the 1980's than the recent concept car. 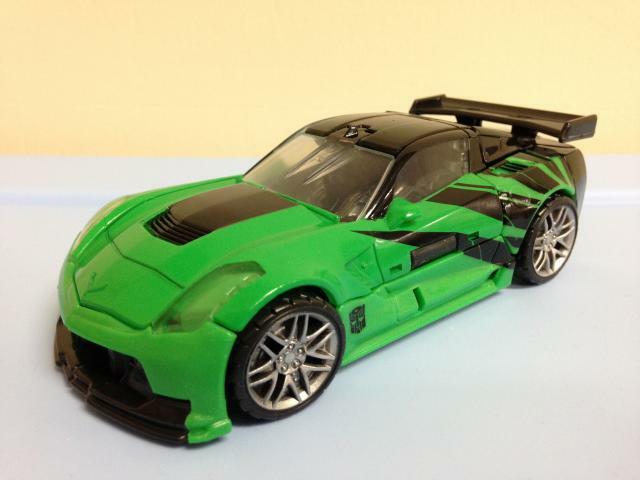 Crosshairs' Corvette mode is solid; everything locks into place well, and it's quite durable. The only flaw I see is the way the wheels are designed - gone are the old wheels with metal pins holding them in. Now the wheels are solid plastic that snap into holes on the body. They still spin well, but they seem a bit wobbly, and can look a bit tilted when sitting in car mode. It's a small issue, but it's there nonetheless. Aesthetically the Corvette looks great. I'm not one to pine over alternate modes - I much prefer robot modes - but this one is terrific. The green plastic is bright and flashy, and doesn't look flat at all. The black accents are a great contrast too; there's a black sunburst-like design on the rear panel of the driver side of the car, the back is mostly glossy black and the front is mostly green with a few black accents. I really dig the asymmetric paint design on the Corvette. There are a few little added designs that bring it all together: black Autobot symbols just behind the front wheel wells, clear plastic windows, windshield, and headlights, and silver painted rims (which are molded with fantastic detail). 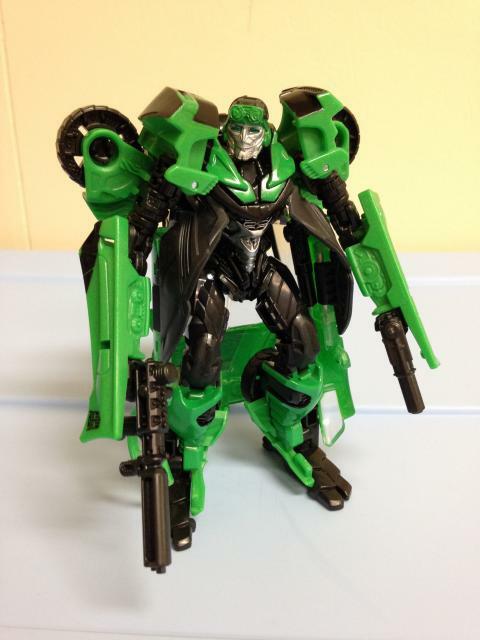 As for the transformation (which seem to be streamlined as of late), Crosshairs is pretty straightforward. Getting him into 'Vette mode isn't tricky once you have certain parts figured out. It took me a bit to figure out how to properly manipulate the elbows - the instructions at that step leave a bit to be desired. Once you get those properly aligned before snapping the sides in, he's a breeze to go back and forth. Nothing is overly frustrating, and everything tabs in tightly. Plus, all three of Crosshairs' weapons can be snugly tucked away underneath/inside the car for easy storage. Overall, the Stingray mode is very well done, and looks fantastic. Crosshairs has a unique paratrooper design, complete with goggles and duster jacket (for those that don't know, that's the cape/jacket from his waist down. Don't worry, I didn't know that either until I looked it up on TFWiki so I hope it's accurate!). The main colors remain the same: bright green, black, and silver. The color contrast works just as well in robot mode as it does in Corvette mode. The light piping in his head works well and looks great, giving him blue-green eyes. As for accessories, Crosshairs comes with three weapons: a submachine gun and two hand grenades that can double as pistols. The hand grenade designation also comes from TFWiki - I thought they were just pistols, but they do have counters molded on them. Presumably these are timers for the grenades, but they could just as easily be considered digital ammo counters, like on the assault rifles in Halo. Both of the pistols/grenades peg into the underside of the duster, and rubber flaps that tab into Crosshairs' chest conceal the weapons well. The uzi/submachine gun can peg into a small hole on his knee for easy weapon access. 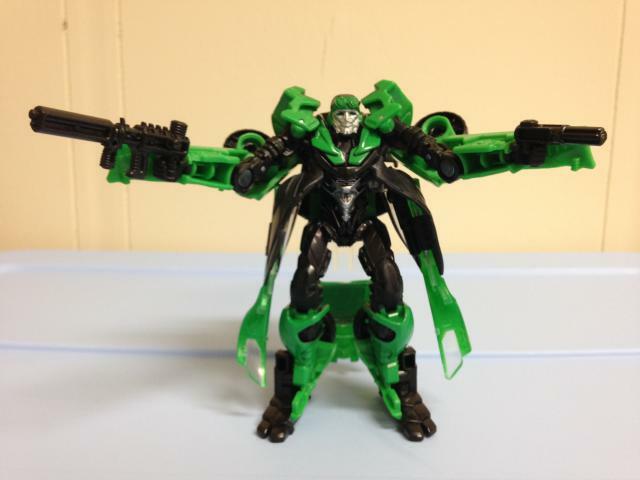 Due to Crosshairs' design, he's somewhat of a shellformer. But at least the shellformer is supposed to be that way - most of the car mode is his duster. Luckily the duster spreads out the back weight making him more balanced than some of the figures that have significant kibble-packs. Contrary to his stock photos and the way he is packaged, Crosshairs' robot mode is much cleaner than meets the eye (har har!). The tailgate folds down behind his head (so he doesn't really look like a green Generations Swerve) and there are two rubber pieces on his sides that tab into his chest to form the rest of the duster which aren't connected in the stock photos. I worry that over time these rubber tabs will fall apart. However, most of the kibble on Crosshairs is accounted for, and there aren't many excess parts hanging off him. 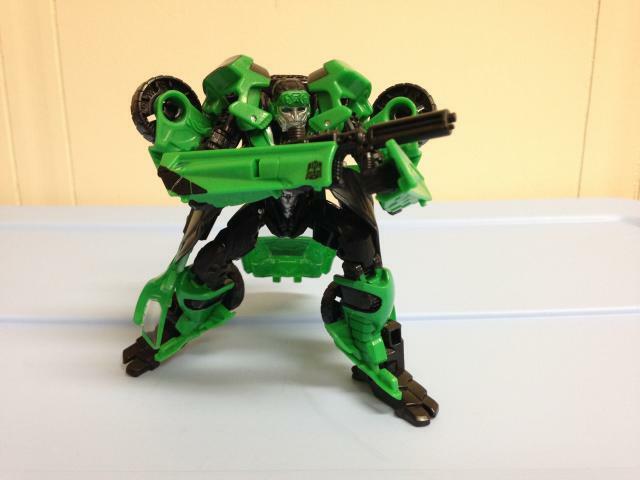 Crosshairs is decently articulated and balanced. The main issues I have with him are his lack of shoulder movement due to the wheel hubs pinching into his head, and the duster parts reduce some of the leg movement range. Otherwise, you can get him into some good action positions, and he doesn't fall over easily due to weight balance and good, sturdy feet. Aesthetically and functionally, I like all of the design choices. Crosshairs feels like a unique robot without being overly weird (unicycle fembots, anyone?). The weapons are fun, and you can do a lot of dual-wielding with him. The robot mode is done well, and is quite screen accurate. The molded detail looks good, the colors pop, and the included weapons give him a bit of fun. Balance is good, but articulation is hindered in spots. Transformation Design: 7. A simpler transformation compared to previous movie bots. It's also enjoyable and quick once you get the elbows/forearms aligned right. Durability: 7. There are some thin spots on the duster portion of the robot mode, and the rubber tabs may go after a while. Otherwise the toy is solid. Fun: 8. A nice sub-machine gun and two grenades that double as pistols. Decent articulation adds to the fun. Car mode is awesome. Aesthetics: 8. Don't pay attention to stock photos or how Crosshairs is packed - the back of the car folds down behind his head. The green plastic pops, and the black is a great contrast. Overall he's a fantastic display piece in either mode. Articulation: 6. Crosshairs has a decent amount of joints, but the shoulders are hindered by the wheel assemblies, and the legs are hindered by the duster. He's not winning any Yoga competitions anytime soon. Value/Price: 7. I got him for $10. At $15, this might be a harder sell. He looks good and is fun, so it's a good deal at a lower price. Overall: 7.5. Crosshairs has some issues, but they're things that I freely live with: he's kind of a shellformer (by sheer design of the character) and articulation is blocked a bit. Neither of these issues are deal breakers for me. Both modes are awesome, and there's good fun to be had with a paratrooper in your collection. This is a solid figure and toy - I don't believe you will be disappointed you if you decide to pick him up.